I would think that older children (pre teens and teens) would be less likely to interfere with sewing projects, but the younger children (toddlers through 6-8) always want to “help”, which can make it difficult to keep your mind on what the sewing project is. I’ve found that when our 4 year old quadruplet grandbabies and their big 5 year old brother are here, I usually try to sneak in a little sewing while they’re taking an afternoon nap, or early in the morning before they wake up. I do firmly believe, however, that the more you allow the small children to “help” with your sewing or craft projects the more they will want to do sewing or crafts when they get a little older. And, because children LOVE to be helping, you can give them a head start in polishing their sewing or crafting abilities when they’re very young. Here’s what happens early in the morning when I’m working on a sewing project and the little ones wake up (the two little boys generally are up first). They set up their stools on each side of me in their “sewing office” and watch me sew. There you go – Zachary is in charge of handing me the pieces to sew, and Brandon is in charge of putting the pins in the pin cushion when I’m finished with each piece. Now, big brother Jacob (the 5 year old) lets us know that he’s old enough for his own workspace, so we set him up on his own sewing/working table so he can mark his pieces of fabric for cutting, drawing on and even glueing together. 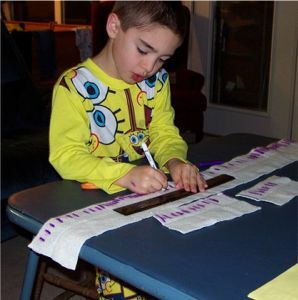 Jacob is very good at measuring, as you can see by all the purple lines he’s drawn on the fabric pieces. Even though the sewing / crafting process goes a little slower (or much slower) when the children are helping, it is well worth the extra effort to get them involved. Who knows, one of these kids may be a professional garment designer when they grow up. The best thing is that their brains are working on creativity which will be with them the rest of their lives. The more you let them help you, the more you are setting the stage for a child who wants to do more than be a couch potato playing video games! Are YOU letting your children and grandchildren learn the art of sewing and crafting by watching and helping you?